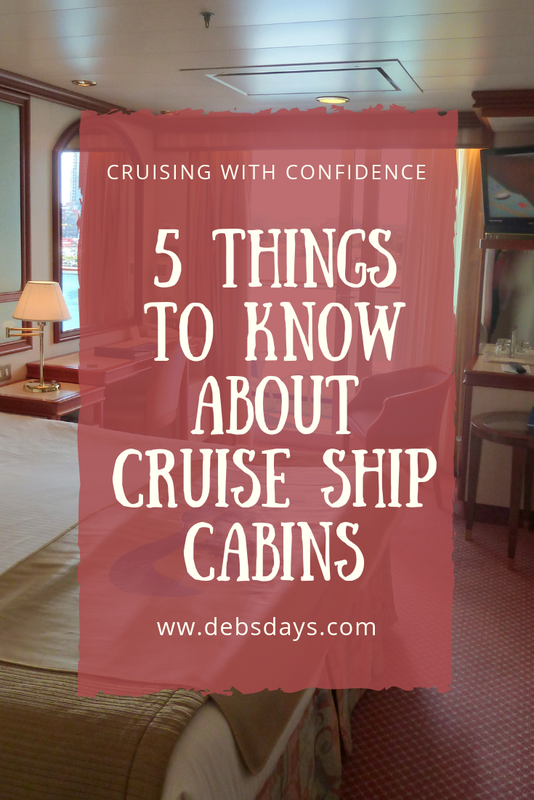 If you're planning for your first cruise you might be surprised that not all cruise ship cabins are created equal. 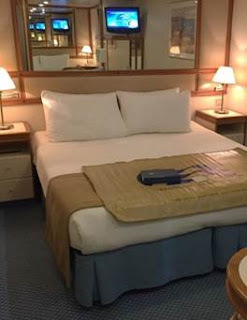 The size, bed configuration, and the location on the ship can be important. 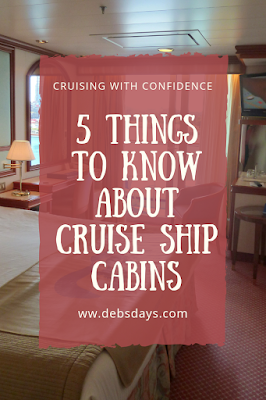 Here are five things you should know about cruise ship cabins. 1. Location can matter. While in a hotel you might request a higher or lower floor or something near or far from the elevator, on a cruise ship you might want to consider other factors. If you're a light sleeper you won’t want to be underneath the nightclub or have a cabin over the theater. Maybe you want something in the middle of the ship so you don't have to walk so far to get to everything. Remember, ships are big. On a regular day of very little walking from activity to activity you can get a couple miles in. 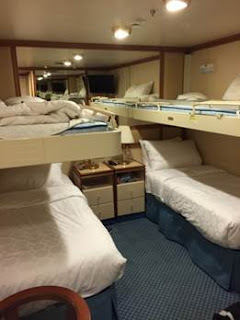 If you are prone to seasickness you'll also want one of those midship cabins on a lower deck as that is where the least amount of movement is felt. 2. Cabins are assigned letter and number combinations to designate the different categories, which in turn determines the pricing. An IA (Interior A) cabin is considered a better cabin than an IF (Interior F) cabin. 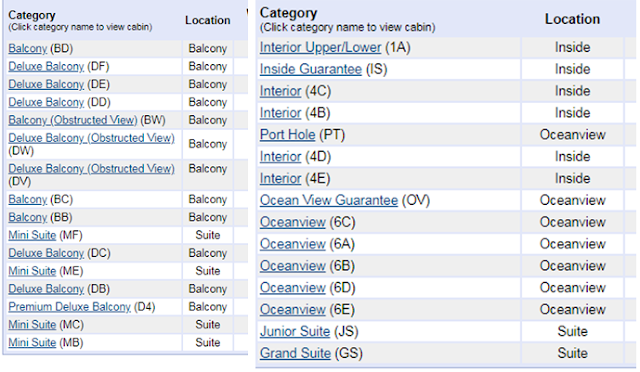 A BB cabin (Balcony B) is considered better than a BE (Balcony E) cabin. The difference in the cabins? Location. 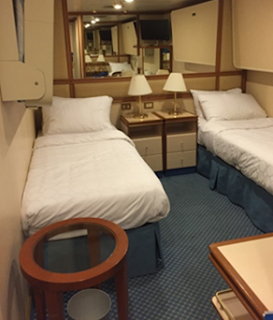 Cabins in the middle of the ship are more centrally located, more desirable, where the least amount of movement is felt, and therefore are more expensive. 3. Cabins can be small. An interior cabin, a windowless cabin on the ship, can be an inexpensive option but might be only 100 square feet. Once all lights are off it is dark. Very dark. It's perfect for a restful and relaxing vacation with lots of naps and plenty of opportunities to sleep in but might not be the best choice for those needing natural light. Going with a balcony cabin? You'll get the light and fresh air but your cabin still is only going run in the 200ish square foot range. 4. Most cabins have twin beds. If you'd rather sleep in the same bed with your significant other your cabin steward can put those twins together to create a larger queen/king size bed. Traveling in the same cabin with another couple? A cabin holding up to four passengers has upper berths attached to the ceiling or wall. The beds fold down to create bunk beds. Adults or kids, it doesn't matter. Someone is going to have to take the top bunk. 5. Cabins can be noisy. No matter what type of cabin chosen or where it is located strange sounds will appear day and night. Vibrations and creaking and grinding noises are completely normal. So is hearing empty clothes hangers rattling their way down the rod at night. Yeah, that's a real thing. If looking for a particular place on the ship or particular type of cabin, the earlier the booking the better. 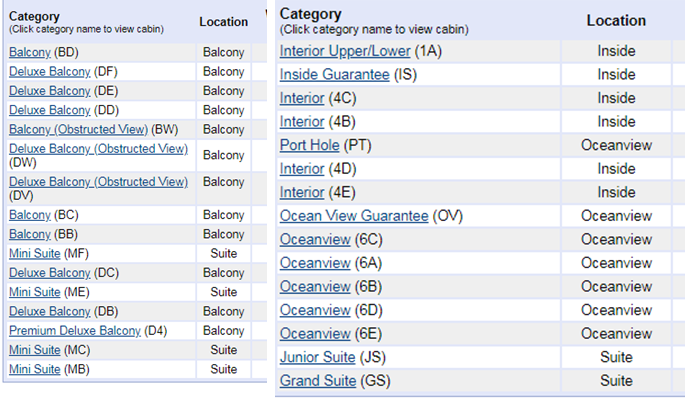 Think about what you want and be sure to pick that special cabin long before the sail date.